La Valette Campsite is situated on the east coast of the island with fabulous panoramic views towards Alderney and France. It is a family campsite where children and adults alike can enjoy the wide-open site to play games and enjoy the freedom that we here take for granted! The site also overlooks Grève de la Ville Bay so it is ideal for a wonderfully refreshing early morning swim when the sun gives it its full beam. We have a modern purpose-built toilet and shower block offering heated pay showers, cubicle washrooms with shaver points and a dishwashing sink. You can also hire one of our pre-erected tents. Everything is provided for home-from home comfort, all you need bring are sleeping bags and lighting. 2 Shower Rooms, 2 Washrooms, 4 Toilet Cubicles, Dishwashing Sink. Fully equipped tents for hire, P.O.A. 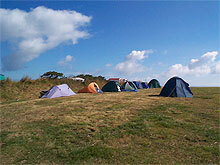 Contact Mrs Adams about terms for pre-erected, fully equipped tents.